A group of San Diego women are speaking out against a highly controversial medication for endometriosis. Team 10 investigative reporter Jennifer Kastner has spent weeks looking at thousands of complaints about serious side effects, including death. The drug is called Lupron. Some people who take it have reported severe bone loss, fatigue, headaches, depression, hot flashes and more. Several patients say their doctors didn’t give them enough warning about how dangerous this drug can be. 10News sat down with Melinda Gonzalez, Linda Whatley, Lisa Howard, Amanda Reynolds and Brooke Benedix of San Diego. 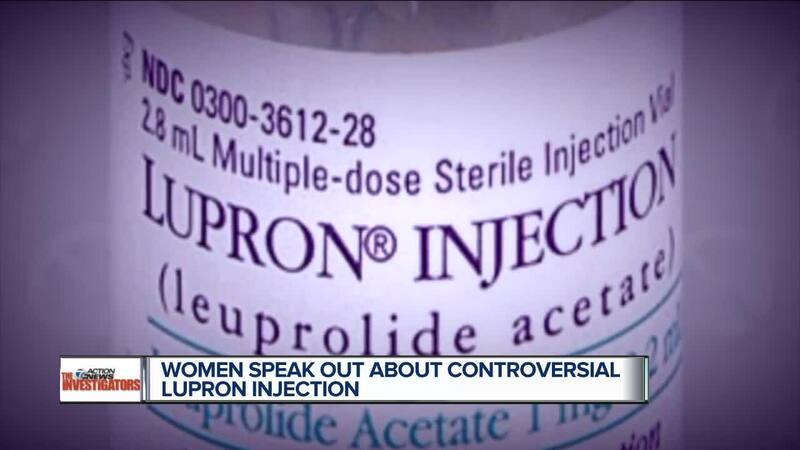 They all say they’ve been affected by a highly toxic drug injection called Lupron. It was originally developed to chemically castrate men who are dying from prostate cancer. It’s also prescribed to relieve pain in women who are suffering from endometriosis, a condition that can cause irregular bleeding and severe pelvic discomfort. “Some days I can't close my hands [and] can't open bottles,” says Gonzalez. “It was such a dark place for me,” says Howard. Despite the controversy surrounding the drug, the FDA reports that controlled clinical studies show it can be an effective treatment. However, the women we spoke to say the risks outweigh the benefits. They also claim that the risks were downplayed by their doctors. There are multiple online support groups and websites dedicated to so-called Lupron victims, like Terry Paulsen. She was outgoing and active before taking Lupron for her endometriosis. Now she has full-blown, debilitating osteoporosis. “What happened was that her immune system started eating her own bones,” says Dr. Alan Levin. Levin is an immunologist. He’s also Paulsen's attorney. Levin is helping Paulsen sue the drug makers for $5 million. The lawsuit claims that at the time Paulsen was given Lupron, the prescribing information didn't adequately warn of the risks of "significant permanent" bone density loss. The drug label warns that "thinning of the bones may occur… which may not be completely reversible" in some patients. Yet in 2011, years after Paulsen took Lupron, the FDA reviewed studies and required that the label drop the line that reads, "For a period up to six months, this bone loss should not be clinically significant." The women we spoke with report lasting side effects like joint pain, which can be caused by bone loss. Benedix is the only one in the group who has not taken Lupron. She said she declined it after reading up on the startling potential side effects. The FDA’s website shows that more than 25,000 adverse cases have been reported and more than 13,000 are deemed serious, including more than 1,500 deaths. The FDA maintains that just because these cases have reported, it doesn’t mean they’re medically confirmed. For each reported case, there’s no certainty that the drug caused the reaction. 10News asked the FDA for details, but our request couldn't be fulfilled because of the government shutdown. “The problem with Lupron is not that the drug is bad. [The problem is] the manner in which it's given,” says Levin. He says physicians need to stop using a “one size fits all” approach to the amount of the drug that's injected into patients, like his client. “You have to monitor it extremely carefully. In [Paulsen’s] case [they gave too much]. Then, the patient suffers,” he adds. We asked drug maker AbbVie for an interview. The company sent us the following statement. “I’d say do your research before you take it,” says Howard. The drug maker of Lupron used to operate under the name TAP Pharmaceuticals. In 2001, it paid $875 million to settle a fraud case. It was accused of conspiring to give kickbacks to doctors who agree to prescribe Lupron. March is Endometriosis Awareness month. The 4th annual local walk to raise awareness will be held on Saturday, March 30, 2019 at Liberty Station's NTC Park. Details can be found at https://bloominuterus.com/2019-endo-walk/ .